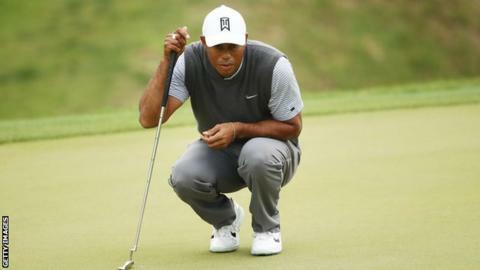 Tiger Woods produced a superb burst of scoring at the WGC Match Play in Texas to set up an intriguing knockout round match with Rory McIlroy on Saturday. The three-time winner was one down to Patrick Cantlay but played the next four holes in five under and won 4&2. McIlroy, the 2015 winner, continued his 100% start with four front nine birdies in a 4&2 win over Matthew Fitzpatrick. Woods, playing the event for the first time since 2013, lost to Snedeker on Thursday and was one down to Cantlay after 10 holes. But over the next four holes he made three birdies plus an eagle at the 13th when he pitched in from 83 yards. Looking ahead to the prospect of a meeting with McIlroy, the 43-year-old said: "That's going to be a lot of fun and I'm sure that both of us will be ready for it." Players champion McIlroy said of the first match play meeting between the pair: "I think it's really exciting for the tournament and both of us. "I didn't put up much of a fight at the Tour Championship [when he carded a final-round 74 as Woods won the title] so hopefully I can give him a better game tomorrow." Eight Europeans made it through to the last 16, the highest number since the event began in 1999. The final match of the day saw Justin Rose edge out previously unbeaten Gary Woodland one up to win Group Two. In the group where all four players began the day on one point, 43-year-old Ian Poulter beat Tony Finau, who bogeyed the final hole. But world number 32 Poulter then lost at the third sudden-death play-off hole to a birdie from Kevin Kisner. Valspar winner Paul Casey, twice a beaten finalist, maintained his unbeaten record in this year's event with a 4&3 win over Cameron Smith to secure a place in the last 16 for the seventh time and he will face Francesco Molinari, who has now won his last eight match play contests. Tyrrell Hatton advanced after winning an all-English contest with Lee Westwood, moving three up after seven holes and winning 3&1, despite a hole-in-one at the 11th from the world number 65. Tommy Fleetwood's hopes ended with a 4&3 defeat against former Open champion Louis Oosthuizen, who had three birdies and an eagle in four holes from the 10th. Matt Wallace also bowed out. The world number 35 was two up at the turn but Denmark's Lucas Bjerregaard, ranked 52, went through with a one up victory.